Planning an event can be very stressful. There is a lot of thought and time that needs to go into the plan before executing it; however, thinking things through in advance will help prevent last minute issues and ensure a successful event. 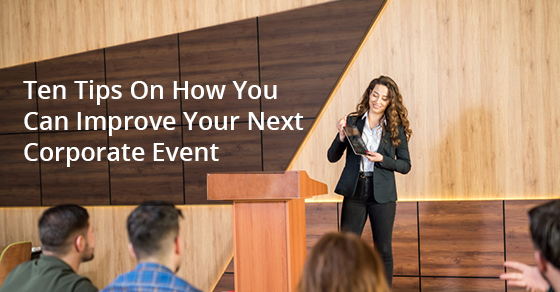 During a corporate event, you might want to have presentations, guest speakers, product introduction, and a social setting for the company’s partners. Here are 10 tips on how to ensure your next corporate event is successful. Your event should have a theme and a message. Your company’s brand and message should be incorporated into the theme of the event. Even if it is a partner event, just make it clear, as there is no point in overcomplicating things. The message should also be clear and simple to avoid misunderstandings. The theme can relate to a new product that might be launching, the visual aesthetics of the brand, or even the time of year (Christmas, Halloween, etc.). You can be as creative as you want and have a costume theme or a set scenario (sports, circus, etc.). It’s important to cater the theme to your company and just have fun with it! Picking the right day is really important to the success of your event. Consider who your audience is, as some people have different times of year when they are busier than usual. You don’t want to pick a date when no one can show up. Consider things like vacation times and international holidays as these dates can take a whole target group of people away from your event. Also, consider if there are other major events or conferences that can keep people away from your event. Keep in mind that other companies will plan events as well and it might be around the same time as yours. Check hotels and restaurant availability to ensure there is no last-minute panic on booking the right places. Budgeting is definitely a challenge everyone will face, and many companies have gone over the first drafted and approved budget. You want to make sure that your event doesn’t go over-budget because this can lead to many problems. Budgeting for costs doesn’t have to be difficult, but you must plan everything out ahead of time, including planning for the unexpected. Small things like taxi cancellation and last minute bookings are points that should also be considered. Budgeting for revenue is more challenging. You should always consider worst case scenarios if your event is based on the number of sold seats when calculating your budget. Also, be aware of the date you pick. If there was a conference beforehand about the same topic as your event, yours might run into some trouble. Some successful events offer early bird pricing and even start promoting their next event at the end of the current one. Having a budget and following it is a step toward a successful event, regardless of how you fund it. Don’t just settle on the first venue you come across. Make a list of possible locations and the things you need from the venue. Visit the venue in person and see if it can offer what you need for your event. Considering things like access, transportation, logistics, acoustics, and so on are all important, but what is most important is the comfort factor. Always ensure that you have a good relationship with the staff you will be working with and make sure you have everything in writing. Always run your creative plans by the venue and ensure that you can proceed. You want to ensure that you have hotel accommodations for your guests, so book in advance. Imagine planning your event, only to find out another company has booked all the nice hotels. Transportation is also important as you want your audience to have stress-free access to your event. Depending on your location, you might want to add transport services to and from your event. Also, ensure that there is a good amount of parking spaces for those driving in on their own. Having external activities is always fun and can ensure that your guests have a memorable time. You can add a teambuilding event or visit a site related to your theme. Also, ensure that if you do plan an external event, inform your guests ahead of time so that they may bring the appropriate items, such as extra clothes and shoes. Consider as well hiring a professional to help plan the external activities and include it in your budget. Proper project and event management are essential. Hiring an event manager can benefit you greatly and help things run more smoothly. You should know the number of people you are going to need in order for your function to be successful. Your venue might even offer services to help you. Either way, hospitality tasks must be performed during your event. Pre-marketing is important to gaining a larger audience to attend, but marketing and documentation of the actual event are just as important. Hiring a photographer and film team will help capture the success of the event. Having good marketing during the function can make an impact on your audience, leaving them with a memorable time. If you have important guests or customers attending, plan to interview them ahead of time for feature articles on the web, newsletters, and social media. You can also use the footage at next year’s event to show what a success the current one was! After selecting the venue, you should start doing on-site planning. This is where the event manager can step in and help. They have knowledge of what things you can avoid and what can make a good event. Make your guests feel special and make them want to be part of your event. Having personalized invitations can add value to your function. Use audio, great visuals, film, and illustrations. Adding visual displays to your event can add a wow factor. Things like presentations, films, LED walls, or projections are all extras you don’t necessarily need, but can impress your audience. They are great tools to support your event and make it more appealing. Next time you want to plan a successful corporate event, follow these tips. They can save you a lot of time and panic, and ensure a smoother process in planning. To learn more about venues and event planning, call Le Jardin at 1-888-529-8573 or contact us here.